Philadelphia, PA October 14, 2016 — The Harman Group (THG), a firm specializing in structural engineering, parking planning and design and construction engineering, is proud to announce Dalian on the Square, a 520,000 square foot mixed use development, celebrated its grand opening on Friday, October 14. THG is the structural engineer and parking consultant on the project, which was developed jointly by Philadelphia’s IFC International and Washington based Dalian Development. 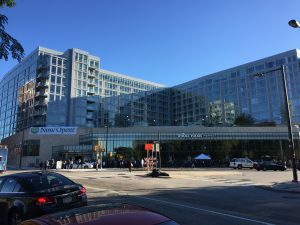 The $160M mixed-use project combines high-end residential with amenities, 85,000 square feet of office space and retail anchored by Whole Foods, and below-and-above grade parking. The ten-story residential portion, Dalian on the Park, features 293 luxury residential apartments in addition to a 35,000 square foot rooftop Sky Park featuring an infinity pool. The ground floor features a 55,000 square foot Whole Food Market and a CVS. To ensure that the market wasn’t impacted by the residential uses, green roof, and pool above it, THG designed an internal mezzanine, which allows for the collection of any leaking water. THG utilized a steel frame for the building with precast plank floors, and cold form steel bearing walls for the residential above. Residents and shoppers can also enjoy five tiers of below-and above-grade structured parking that accommodates up to 490 cars. Dalian on the Square broke ground in summer of 2014 and celebrated its Topping Off in November of 2015. Founded in 1984, The Harman Group, Inc. provides structural engineering, parking planning and design and construction engineering services. The Harman Group has the unique ability to provide outstanding engineering solutions, using state of the art computational methods, Building Information Modeling (BIM) and other technology, combined with high-level, personal customer service. For more information, please visit www.harmangroup.com.